The ESSEX COLLECTION blends a classic railing style with superior craftsmanship using state-of-the-art materials. The impressive ESSEX railing makes a statement using large balusters and a broad handrail. Design options include a choice of balusters, railings, newel posts and caps. All railing system components are made from low-maintenance, durable polyurethane so they look and feel like wood and resist peeling paint. Click here for ESSEX COLLECTION Railing Specifications, Drawings and Images. Click here for pricing examples of a typical 8 by 16 foot deck. 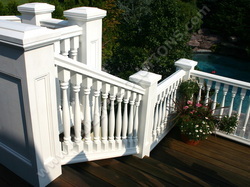 The BRISTOL COLLECTION represents the quintessential New England balustrade. The BRISTOL railing has understated proportions that are defined by elegant turned balusters and a finely detailed handrail. All railing system components are made from low-maintenance, durable polyurethane that looks and feels like wood. Polyurethane railings and balusters resist peeling paint and the effects of the elements. Click here for BRISTOL COLLECTION Specifications, Drawings and Images. The HAMPSHIRE COLLECTION is a railing system that combines traditional style with clean, simple lines. The HAMPSHIRE railing is defined by its square balusters, sleek handrails, and smooth newel posts. All railing system components are fabricated using cost effective and low-maintenance cellular PVC, not the shiny plastic found in the big box stores. 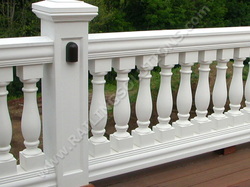 Click here for HAMPSHIRE COLLECTION Railing Specifications, Drawings and Images. In addition to our three signature railing collections, we have hundreds of baluster and railing profiles available from industry leaders like Fypon, Spectis, Azek, Trex and many more. 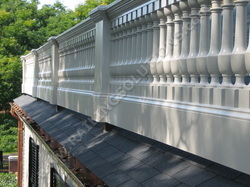 We can replicate historical railing profiles or custom-fabricate an original railing design. 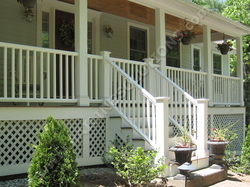 Bring us your deck and porch railing ideas and your specific requirements and we will make it a reality. We have a low-maintenance RAILING SOLUTION for you!